The most plentiful series of automatic models is the Accumatic line. There are 66 models, even more when you count variations. The K-series and the Thin-o-matics are in the high 50's though and close behind. If you add in the calendar models the Dateline Accumatics still edge out the Dateline Thinomatics but the numbers are still pretty close. There are well over 200 automatics models in all. The second Accumatic to come in a rolled gold plated case was the 1963 Accumatic A-601. It was produced for only two years. 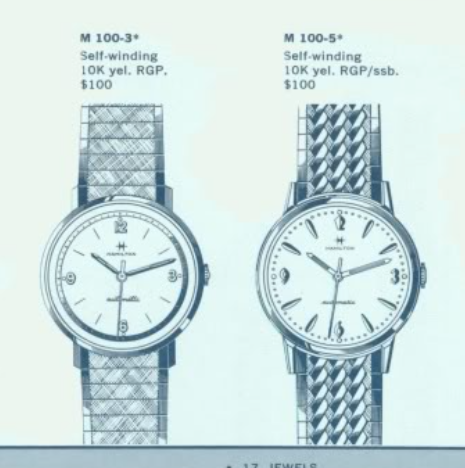 The A-601 came on a specially selected bracelet or on a strap. It's a pretty complex watch and is better looking in person than the black and white catalog gave it credit for. Tucked inside the Accumatic, and in most Accumatics, is an ETA-based automatic movement. In the A-601 it's a 17 jewel 689. I recently received a project watch A-601 from a fellow collector friend of mine, and I suspect he has the original bracelet squirreled away to put on this watch once it's in running order. As received, it doesn't look too bad. It's a one-piece case and, unlike a stainless steel back, the RGP back doesn't make you wonder if it's meant to separate from the front. However, it does have a couple of marks on the case that make you wonder if someone tried to get into it from the rear. This watch opens through the crystal. With the crystal out of the way, you can see that this dial has an integrated reflector ring. There's a lot going on in this dial and I wouldn't want to try to get it refinished. Yikes! I guess you can't judge a book by it's cover. Check out this movement! It's a rusted, filthy mess. I'm surprised the dial didn't show more discoloration. Water has definitely gotten into the watch. Anytime you see your crystal cloud over from moisture, you should open it up and let it air out. If it happens repeatedly, you should probably have a watchmaker look at it. However, as a general rule, keep vintage watches away from water, sweat, sinks, etc. The underside of the oscillating weight is just as bad as the topside. Also, there's something going on with the reversing wheels - as this rotor only spins in one direction. It locks up in the other direction. It should be free to rotate either way. Things aren't much nicer inside the movement. Check out the dust and debris on the balance wheel and hairspring area. This watch will spend an extra 10 minutes in the cleaning solution. Everything is cleaned and dried. Surprisingly, everything looks pretty good except for the rotor weight. It still looks a bit corroded. The movement is reassembled and appears to be running nicely. The timer will tell for sure. Not too shabby. I'll leave it like this, as it will likely slow down a little over time. Despite a thorough cleaning, the reversing wheels are damaged. The only alternative is to replace them with parts from a donor and I'll use a nicer rotor while I'm at it. This rotor carrier is from a 689A - the A had a section cutaway from over the balance assembly. So if you look closely you'll see how they are slightly different shapes (although one is upside down from the other... the silver wheel on the left of the carrier on the left is the bottom of the golden wheel on the top of the carrier on the right). With the inside running nicely and looking as good as the outside, the watch is reassembled and it's time for it's pillow shot. I think the A-601 is a sharp looking watch. I wonder why it was made from only two years? Perhaps it was a little ahead of it's time... it looks more like a late 1960's watch to me than an early '60's model. OOPS! So it occurred to me that the A-601 looks a heck of a lot like the 1964 M 100-3. The tips of the lugs appear tapered on the M 100-3 and the A-601's appear to be flat. The dials look almost identical although the M100-3 has hour marks. Here are the two side by side from the 1964 catalog. I think the watch above is actually a M 100-3. I find it interesting how many shades of gray there are in the Hamilton model line up. There is a broad continuum of watches from the entry level stainless steel models with Swiss-made movements to the solid 18K gold, or even Platinum, models with USA-made movements. You would think there would be clear lines of separation between model levels... but no. You will find 18K models with Swiss-made grades and stainless steel models with Lancaster-made movements... and everything in between. A good example of a "tweener" is the 1959 Farrell. At first blush it looks like a typical 1950's model with what would probably be a 17 jewel Swiss-made 673 behind the dial. 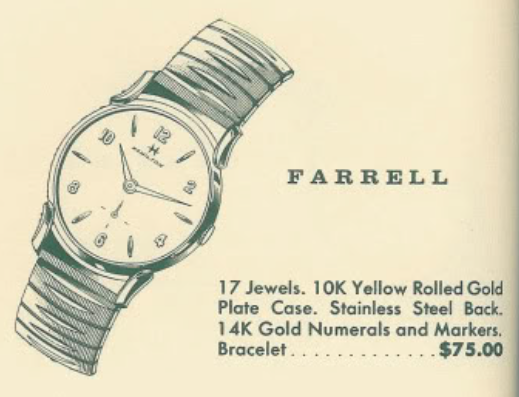 However, you'd be wrong to assume that because the Farrell actually has a 17 jewel USA-made 730 under the hood. In 1959 it came on a strap or bracelet, the latter being a leather / metal combination used on several models from the same period. The case was comprised of a 10K gold gold plate (RGP) bezel with a stainless steel snap-on back. In 1960 the bracelet was changed to a Flex-let model that was also used on other period models. So you can use the original bracelet to get a better idea of what year the watch was made. This second style bracelet was also used in 1961. You don't tend to see the Farrell to often in the wild. I'm not sure why that is but I suspect it was simply because it was more expensive than similarly designed models that used a Swiss movement. 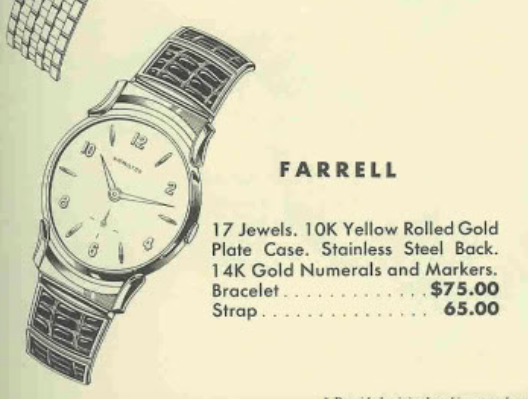 For example, the 1958 Lowell is quite similar and was priced at $47.50... considerably less than the Farrell. I recently received a Farrell in serious need of some TLC. In fact, you would think that it arrived by boat, as it was an off-white green color as if it was sea sick. The dial was green and spotted with what looks like mold or something. The watch still has it's original bracelet... it's a bit corroded too but it's a nice find and dates this watch to 1960 or 61. There was a lot of corrosion around the watch with pitting and gunk galore. The worst section appeared to be the spring bars. They were frozen solid and reminded me of what sometimes happens to old batteries if you don't remove them from electronics. The spring bars were frozen solid and the only way to remove them is by cutting them out. It's a nasty job, to be honest. If it's an old Speidel bracelet I will usually snip right through it and spring bars with small wire cutters. However, since this is the original bracelet I will try to cut just the spring bar. In the shot below you can see that a portion of the spring bar is stuck in the case lug. That was actually the case with three of the four lugs. With the bracelet off I can turn my attention to the inside of the watch. I don't know when the last time this watch was overhauled but I wouldn't be surprised if the answer was "never". It's filthy inside. The old spring bar tips were frozen solid and didn't budge. The only way to clear the holes for new spring bars is with a tiny drill bit. Surprisingly, the movement itself is in nice shape... a true testament to the quality of Hamilton movements. Everything is thoroughly cleaned in the ultrasonic. The dial cleaned up "fair"... it still shows some spots and a little green speckling but it looks way better, as you'll see in a bit. The 730 is almost identical to the earlier 747 grade, with the exception being the balance is shock jeweled to protect the delicate balance staff. The timer reveals that everything appears to be in good order. It's running about one minute fast per day but I can slow it down with a slight adjustment to the regulator. The two lines representing the beat error and beat rate are approaching horizontal. The distance between them is the beat error (the closer they are the closer the error is to zero) and the slight upward trend implies the watch is running a smidgen fast. You can see how the trend on the right of the screen decreases as I moved the regulator towards "slow". As the lines wrapped over the left side of the screen the two lines approached horizontal. With the watch movement back in good health, all that's left is to reinstall the dial and hands and tuck it back into the freshly polished case. The dial looks much better but it's not perfect. It could be made to look like new by refinishing it but that's a personal judgment call at this point... a decent original dial is usually preferable to a perfect refinish. If the dial was worse it would be an easier decision. This one is a tough call. My most recent post was an uncatalogued model and today's post is too. I have it on good authority that it's an M 100-4 but don't have a catalog image to share. I'm guessing that it's from 1963 because in 1964 there was an M 100-3 and an M 100-5. The dash (-) means it's the 3rd and 5th model priced at $100. If the -4 was to occur, it would have to be before the -5 and this the -5 is a 1964 watch, then the -4 must be earlier. How's that for logic? The M 100-4 came in a yellow 10K RGP case with a stainless back. Tucked inside is a 17 jewel 689A movement, made by ETA. I've had an M 100-4 for a long time, several years to be exact. However, I never serviced and I rarely wear it. Since I don't have one on the blog yet, I thought I'd overhaul it and post it for posterity. I've seen a number of M 100-4's in the wild. It's a little easy to spot because it has numbers only at 12 and 6 and relatively long markings for the minutes (or seconds, I suppose). The stainless steel back has fooled many people into thinking this is a two-piece case. But it's not - it opens through the crystal. I like to use Bergeon tools whenever practical. They are rather expensive but the quality is excellent. The 4266 crystal lifter is my go-to choice for opening one-piece cases. The tool compresses the crystal around the perimeter, squeezing it down to a slightly smaller diameter and allows the crystal to come out of the case. Putting it back in is a breeze too. The 689A is a typical ETA movement. A couple of minor changes to the oscillating weight carrier is the main difference between the 689A and the 689. This case incorporates a movement ring to secure it inside the case back. This style of ETA movement is interesting because it uses a special cannon pinion that is inserted inside a toothed wheel. The hour wheel was removed to show the cannon pinion. The cannon pinion can slip inside the wheel and allow the time to be set without jarring the gear train. Unlike a conventional movement, the cannon pinion is driven by the third wheel pinion and not the center wheel. In fact, the center wheel isn't even in the center, it's off to the side in the lower left in the picture. Everything is cleaned and dried before being reassembled. The trickiest part of this movement is to get the four-wheeled train bridge properly seated. Sometimes it drops right in place and other times it can take 20 frustratingly-long minutes. Without the rotor in place, the movement looks like a garden variety manual winding movement. Now comes the movement of truth - putting the balance assembly back on. If everything is lined up correctly, the watch will start running. Success - the watch is running so it's off to the timer to see how well it's ticking. It's a little fast but I'll leave it like this for now. It's not uncommon for it to slow a little after it runs a bit. From there it's just a matter of putting the rotor back on as well as the dial and hands. With everything assembled, it goes back into the case and I can push the crown back onto the female side of the two-piece stem. Then the crystal goes back on and... voila! It's finished. I think it's interesting how so many models were uncatalogued. Certainly there aren't as many as those that were catalogued - but still - there are plenty of unique models with very little documentation. Take for example the 1968-ish Thinline 6588. Based on the movement used and when it was offered, I would guesstimate it at being from this era. The way to tell if a Hamilton model is authentic is to look at the inside of the case back. It should say "Hamilton Watch Co. Lancaster PA" along with the case material and serial number(s). Models may not have been catalogued because they were intended for presentation awards or a special market... perhaps international or even a private retail chain. In any event, I know the Thinline 6588 exists because I have seen other examples from other collectors, including one with it's original sticker on the case back. I recently picked up a Thinline 6588 and I believe it came with it's original Kreisler bracelet. I think it's original because it's neatly trimmed to fit the lugs, it's engraving matches the florentine engraving on the bezel, it's made my Kreisler - a common provider of Hamilton bracelets, and I've seen other 6588's with the same bracelet. I don't know for sure though - as there is no catalog image to compare it with - but I'd be willing to bet lunch money on it. The Thinline 6588 is similar to the 1965 Darwin and it's also closely aligned with the 1968 Thinline 6508 - although that has a second hand. Assuming the 6588 was numbered around the time of the 6508, I'd guess this model is from 1968 as well. The case back is stainless steel, the bezel is 10K RGP. The dial is in very nice shape but there is a rub mark from the bezel opening. I should be able to clean it up a little but you can't really see the marks with the watch assembled. The 17 jewel 681 is not very large - probably a smidgen bigger than a Nickel and definitely smaller than a Quarter. It doesn't look like this one has been cleaned in a long time - if ever. There are no watchmaker's marks inside the case back - I bet I'm the first person to touch this movement since it was originally cased 45+ years ago. Everything is cleaned and dried. Not to worry, the dial is reflecting my work light - it actually cleaned up nicely. The freshly lubricated movement is clean and sparkly now. It appears to be running nicely - we'll see what the timer has to say. Not too shabby... the beat rate is a little slow at -13 seconds per day. The amplitude is fine and the beat error of 0.7ms is acceptable too... although it is easily adjusted. There... I sped it up slightly and was able to reduce the beat error to zero. The dial and hands go back on and everything gets tucked back into the case. This watch turned out very nicely. It's not a large watch, especially by today's standards. It's probably better suited to a woman than a man but it's a great example of the model, nonetheless. 1954 was a year of firsts for Hamilton. It was the first year of Automatic watches in Hamilton's line up. It was the first year Swiss-made movements were used in Hamilton models. It was the first time a calendar complication was introduced. It was the first year shock-protected jewels were added to balance assemblies. And I suppose you could also say that it was the first year that stainless steel was used as a case back. That last statement would only be sort-of true. The first use of stainless steel was actually the 1941 Lexington and there were a handful of other all-stainless models prior to 1954 (like the Steeldon and Clinton, et al). But it was 1954 that introduced gold watches with a stainless steel back. Stainless steel served two purposes. First it was very durable - and durableness is important for a case back. Second, it was less expensive than a gold or gold-filled case back. It seems a little odd to use stainless steel on an otherwise solid gold watch but it was used with with solid 18K, 14K and 10K models. I guess the logic was stainless steel was a non-visible way to minimize a watch's cost while not compromising the overall design aesthetic. The first solid 10K model with a stainless back was the 1954 Automatic K-350. It was only produced for a single year. 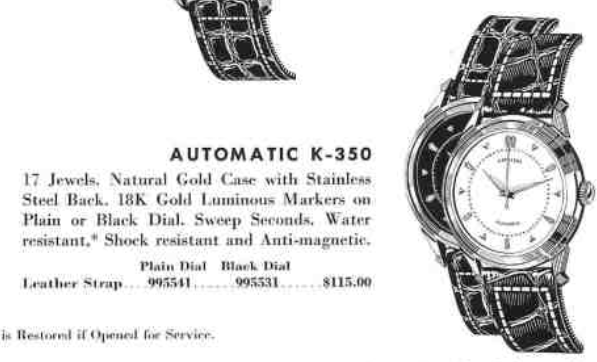 The K-350 was available with either a butler-finished dial or a black finished dial. It featured solid 18K gold markers. Tucked inside the K-350 you will find a Swiss-made Hamilton 661 movement with 17 jewels. This grade is used in the majority of models in the Automatic K-series line. I recently received an example of a K-350 from a fellow collector. It was a new arrival for him and he wanted to make sure it was properly serviced before wearing it a lot. The case back comes in one piece and a case wrench that engages at least two of the slots is needed to open it. I prefer using an adjustable three-pronged wrench but there are a bunch of different options to open case backs like this. The movement is bright and shiny - that's a good sign. The gasket got a little smooshed when it was last installed. I'll try to smooth that out when I reinstall it later. The case back makes it easy to identify what model this is. I don't see any watchmaker marks inside it so who knows if it has ever seen a watchmaker before me? Everything gets taken apart in order to be thoroughly cleaned. Although the watch looked to be very clean, some of the parts were hard to separate, making me think the old oil had gelled them together. The watch is back together and running nicely - time to see what the timer thinks of it. Well, it's running fairly well but it's a little fast at 2+ minutes per day. This watch is very easy to regulate and it won't take much to slow it down. A few tweaks to the regulator brings the beat rate right inline with good amplitude and a low beat error too. One of the hardest parts of reassembling this movement can be getting the oscillating weight carrier back onto the movement. I'll put the weight on last, after the movement is back in the case. The dial has a couple of very minor spots along the perimeter but otherwise this watch looks fantastic. My camera usually reveals every minor flaw and this watch looks great. It's a fine addition to my friend's impressive collection.